When we pack our bags and check in at the airline counter for a long overdue trip to Maui, most of us never give a second thought to what goes on behind the scenes of an airport to keep us safe. Just like home, school, or work, the entire airport must create a cohesive plan, working together to prepare for potential emergencies. 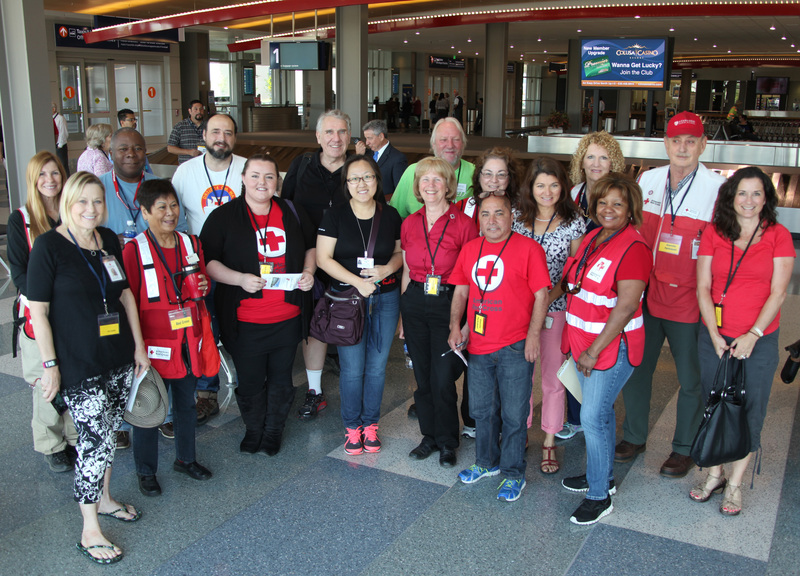 On Wednesday, May 14, a group of Red Cross volunteers from the Capital Region had the opportunity to participate behind the scenes volunteering with the Sacramento International Airport in their Triennial Airport Exercise. The exercise is a coordinated effort between the airport operations, law enforcement, fire and rescue, chaplaincy, and the Red Cross. 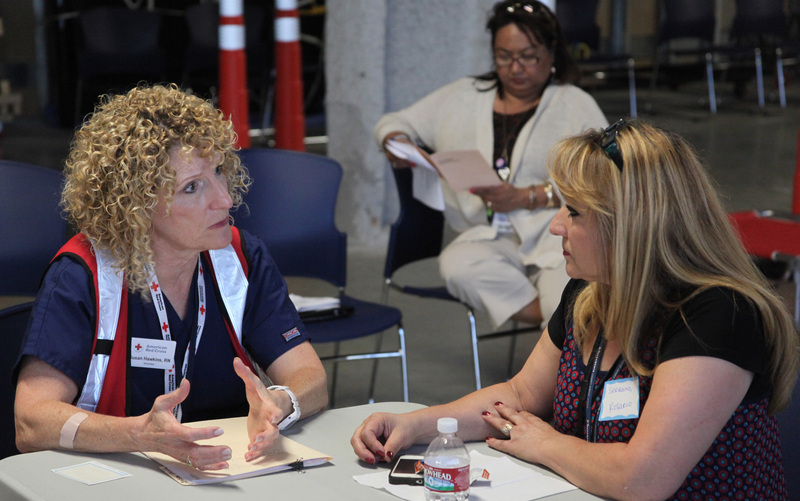 Health Services Volunteer Susan Hawkins speaks with a “passenger” in the family reunification center. In this drill scenario a plane carrying sixty passengers on board was immediately turned around after takeoff because of flight control problems. It made a “hard” landing upon return. For purposes of the exercise, an actual Coast Guard C-130 was flown and returned with the sixty passengers, primarily US Coast Guard service members. The Red Cross had two teams participating. A team of eight led by volunteer Carol Willis, provided mental health and health services support to the passengers and families. “This type of event is incredibly stressful and emotional on all involved, so we are here to provide help and comfort to the families dealing with all of this uncertainty,” said one volunteer. The second and larger group played the role of friends and family of the passengers. Each volunteer was assigned a passenger as his or her family member and then participated in the Family Reunification Process. The process of re-connecting families with their loved ones is both arduous and emotional. Some of our Red Cross volunteers fully embraced their role, giving tear-jerking performances and adding a critical element of realism to the exercise. Incidentally, “Academy Awards” were mentioned several times. Also participating in the event was our illustrious Bob Eger, who was in the center of the action, helping to coordinate with other agencies at the Emergency Operations Center. 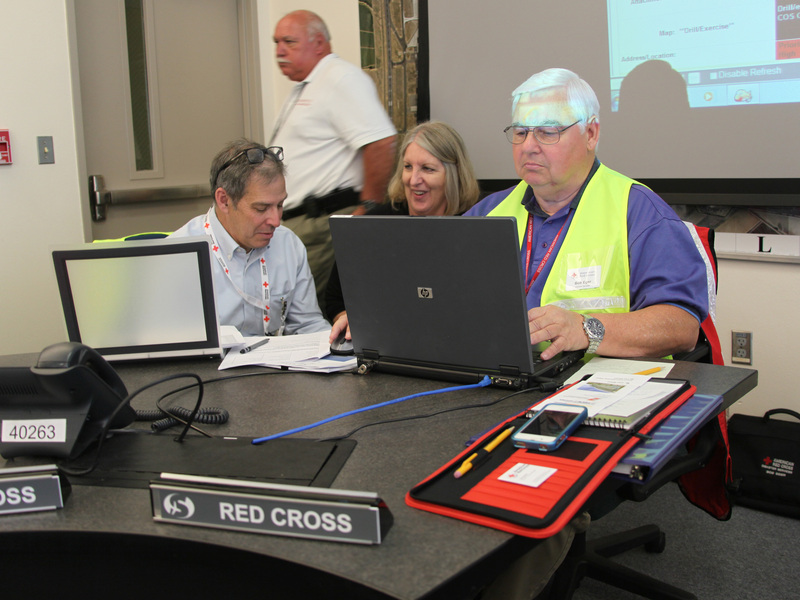 Volunteer Bob Eger (R) works with Robin Friedman of the Red Cross (L) and Kris Nelson of Sacramento OES in the EOC. As Red Cross volunteers we got to learn more about the operation and coordination of many individual agencies coming together for emergency preparedness. It was also a great team building opportunity giving us a chance to get to know each other a little better as we each played our role.